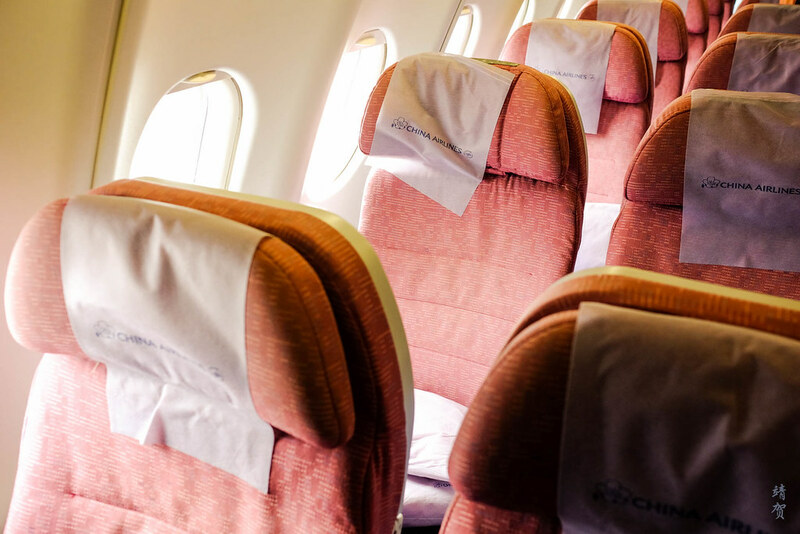 This trip was a short trip that I needed to make to Hong Kong with my Dad and for the regional flight to Hong Kong, I managed to find a good price flying with China Airlines. 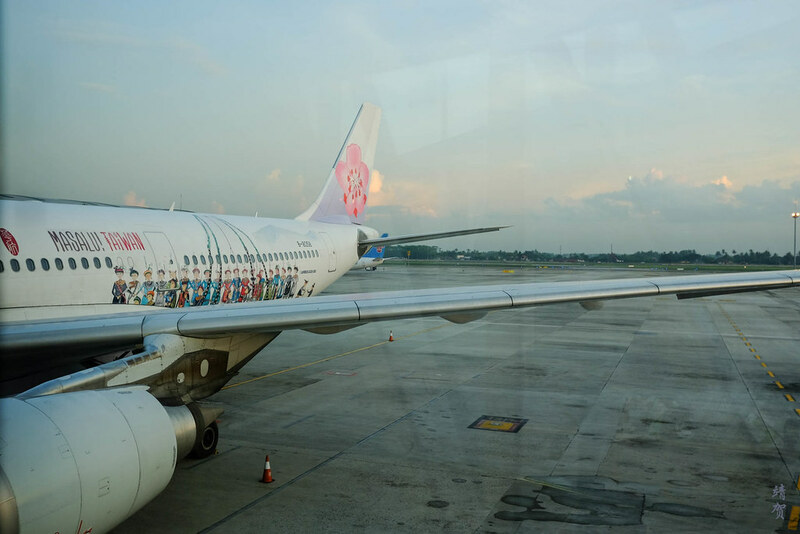 This Taipei-based airline operates a fifth freedom route between Jakarta and Hong Kong as well as between Surabaya and Singapore. 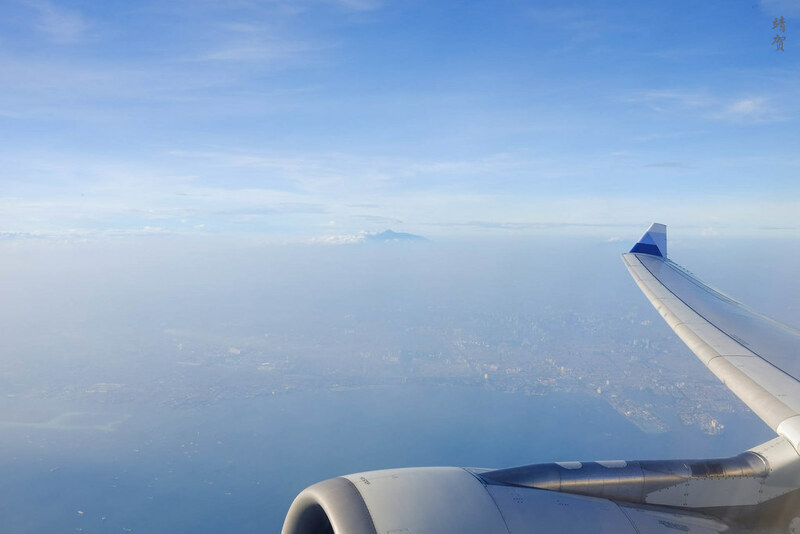 With a price of around IDR 4 million (~$280) for a round-trip ticket that earns me miles on my Sky Team membership, I think it was a pretty good deal. The only drawback is the outbound flight departs at 6:30am in the morning. With my Sky Priority status, I was able to check in on the Business Class counter and get lounge access after passing through immigration. Due to this status, I had made an online check-in a day earlier and was able to snag an exit row seat. 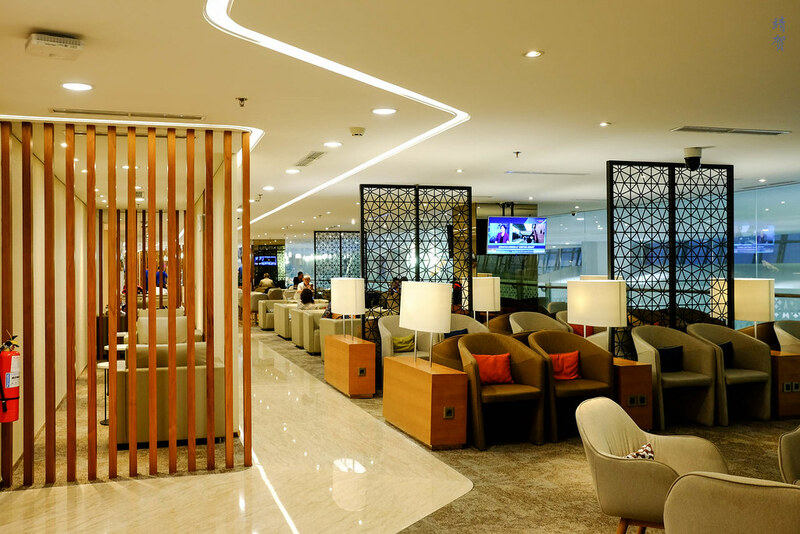 Access to the Garuda Indonesia Business Class lounge was included or the Saphire Lounge. Since I have been to the former and it was a nice lounge with decent food, that was where I ended up in while waiting for the boarding time on the boarding pass. The lounge was quieter early this morning and I managed to get some nice shots of the lounge while waiting. When boarding was called, I proceed with my Dad to the boarding gate and gained priority boarding, once again thanks to the Sky Priority status. 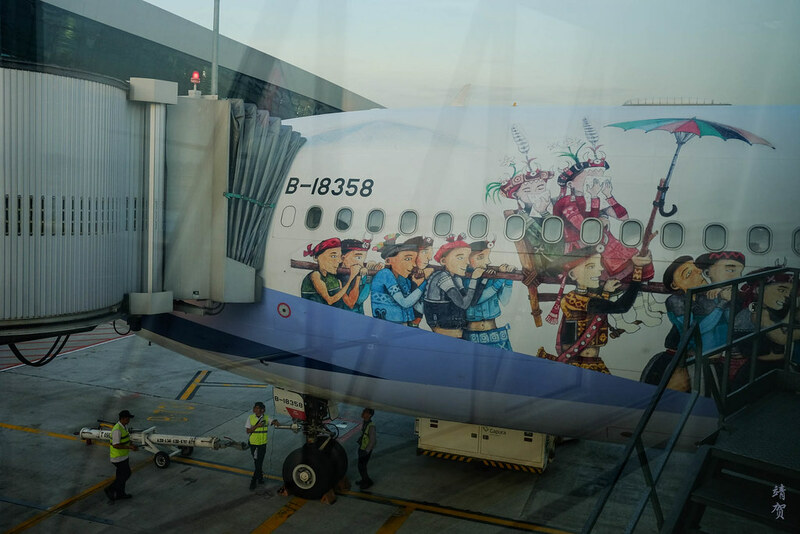 Turns out the plane has a special livery and features a renovated interior. Even without the special livery, China Airlines have one of the nicest plane design. 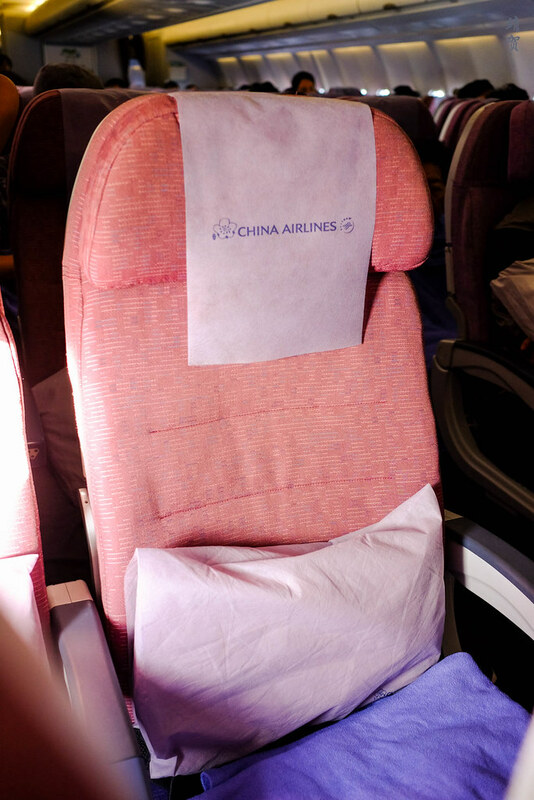 On every seat there was a pillow and a blanket. 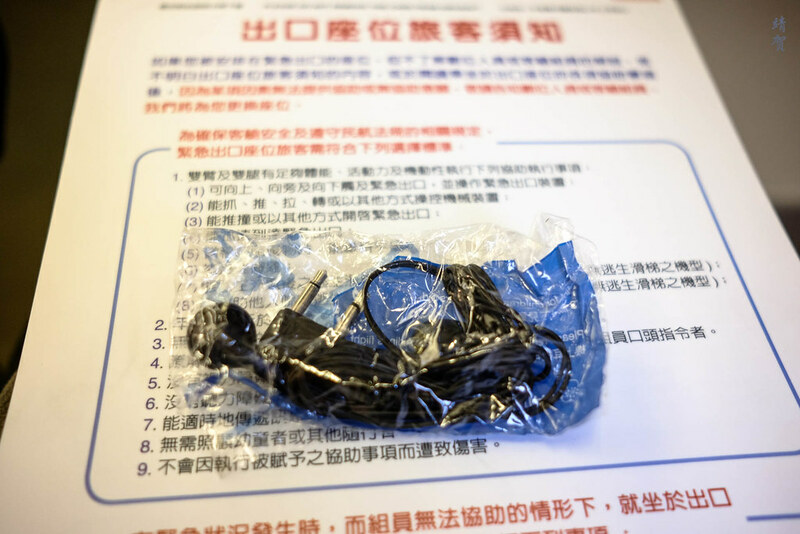 A small pair of flimsy headphones were also included in every seat though I had no need to use them as I brought my own headphones. 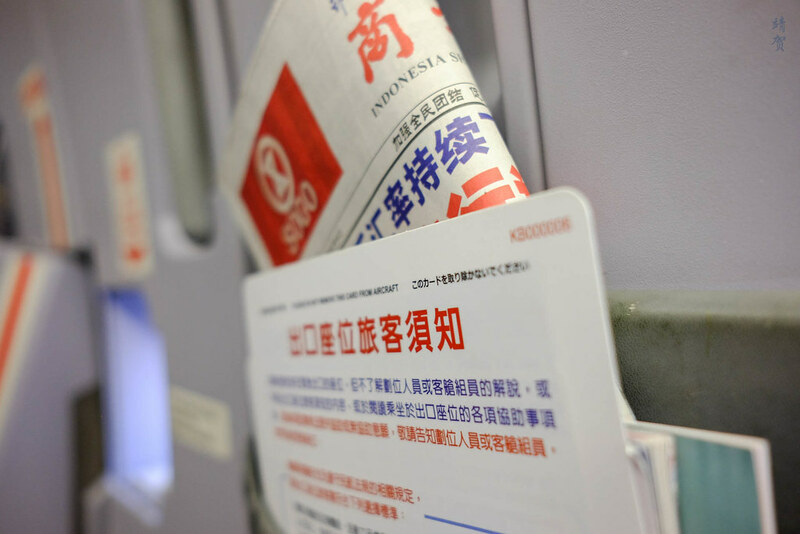 As we got comfortable in the seat, the cabin crew came over and offered Indonesian and Taiwanese Chinese newspapers. Doors were closed at around 6:20am with the economy cabin about 60% full as there was plenty of seats around us. 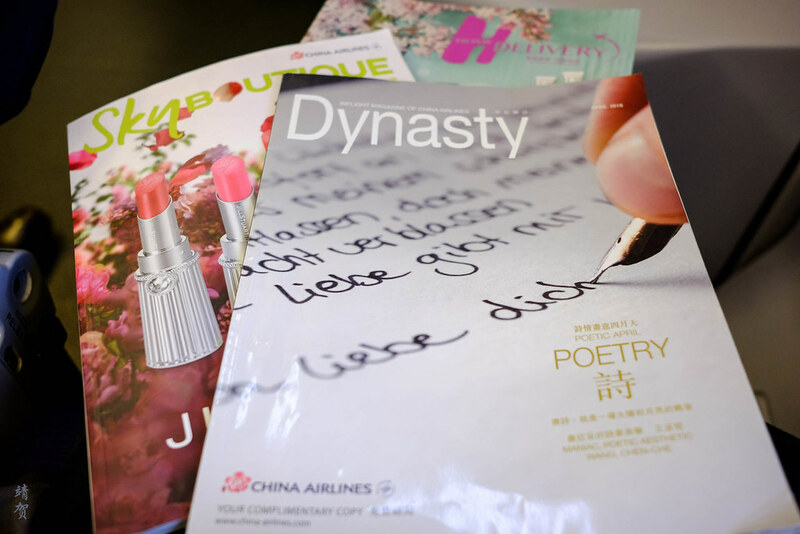 While waiting on the plane, I checked out the airline’s inflight magazine which has most of its articles in Chinese. 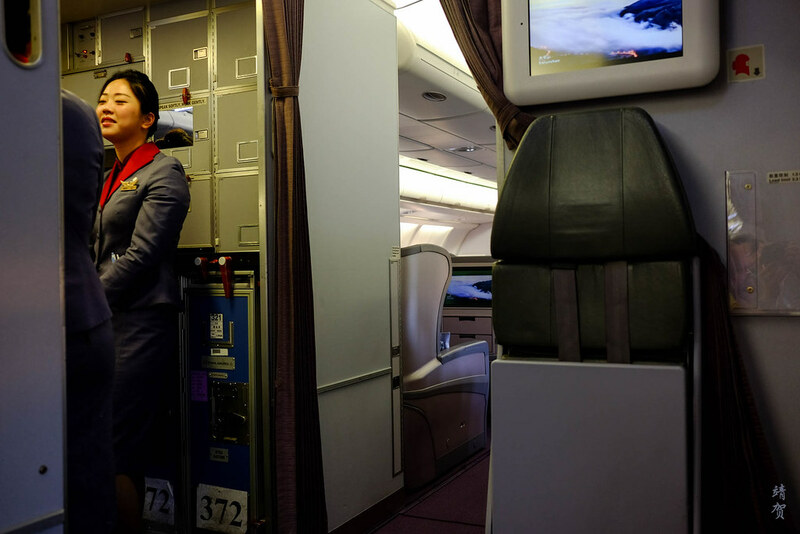 Before we pulled back, we were welcomed by the inflight service manager Irene Lou onboard as a Sky Team Elite Plus member. Cabin announcement was conducted in Taiwanese, English and Chinese with the safety briefing done in English and Chinese. 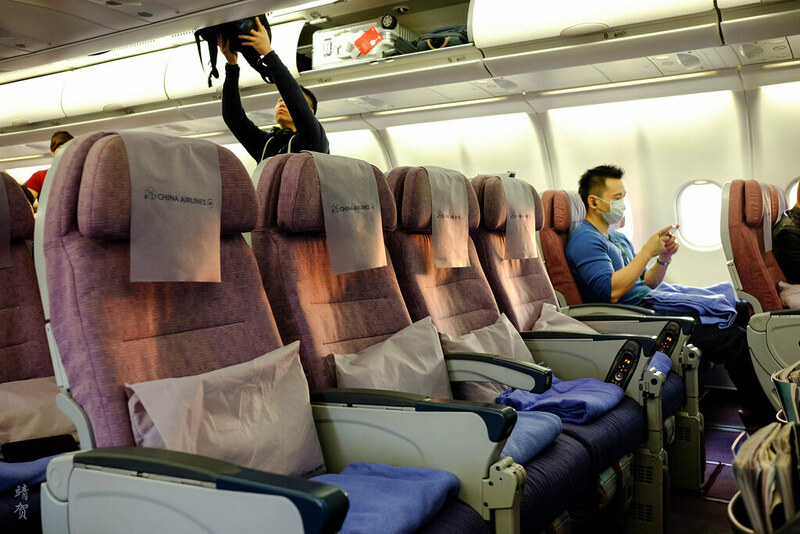 Upon take-off, many of the passengers started drawing down the window shades to continue sleeping. This made the cabin dimmer and I guess this is to be expected with an early flight as many passengers will catch up with their lost sleep. 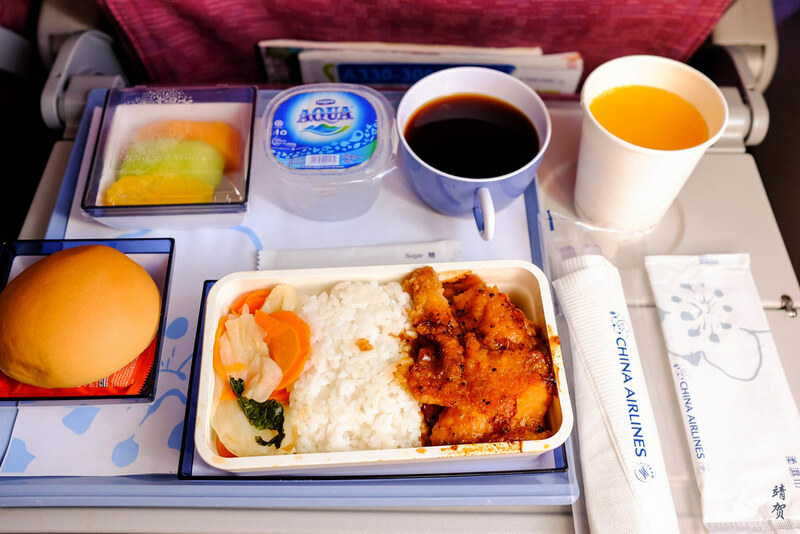 Meal choices was offered in Chinese with fish fillet with rice or chicken with rice about an hour into the flight and I was surprised it was not a breakfast fare. 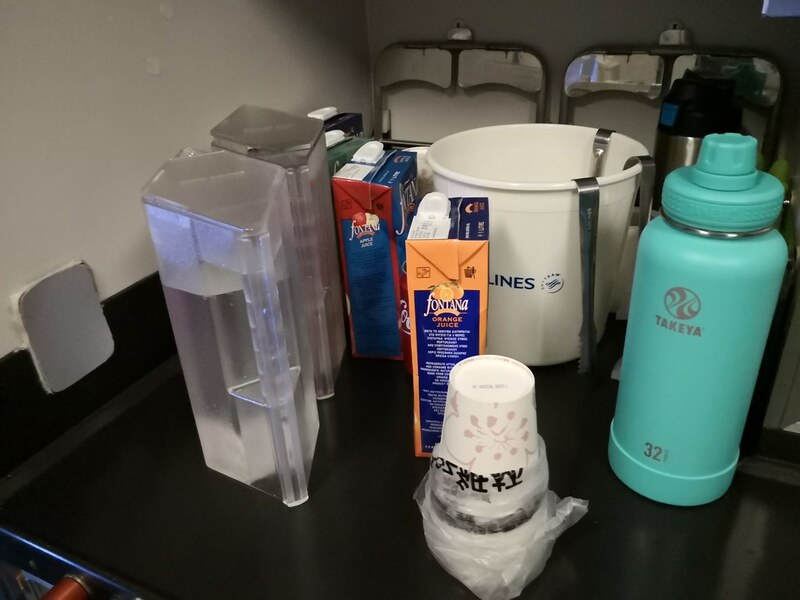 Coffee or tea was offered in addition to the meal choices. Crew also asked if I need creamer and sugar with the coffee. For the main course, I picked the fish and it was a tasty dish as the fish fillet had black pepper sauce over it. A bun was served on the tray with a small plate of fruits. There was also a small cup of sealed mineral water but the tray does look a bit spartan. 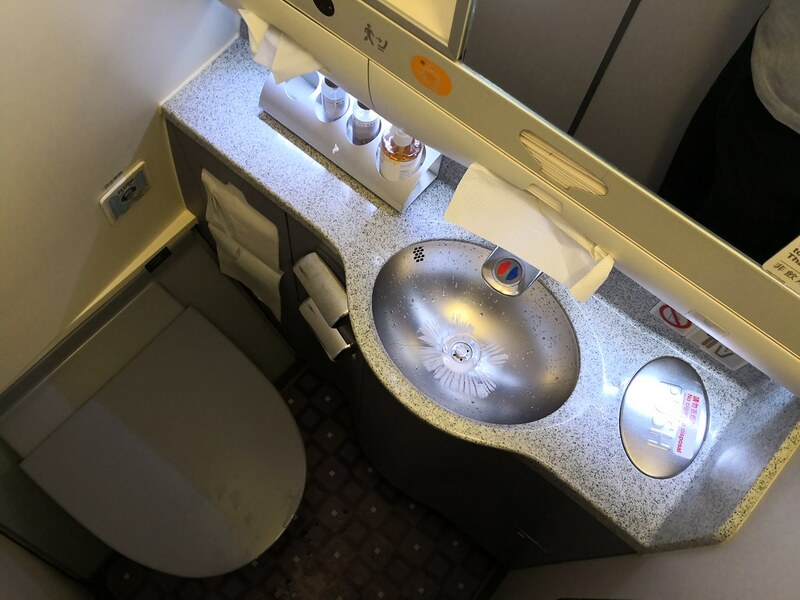 After the meal service, cabin was dimmed for passengers to rest for the flight and since the window seat on the emergency exit row has an intrusion due to the door, I moved to the seat behind to enjoy the inflight entertainment. 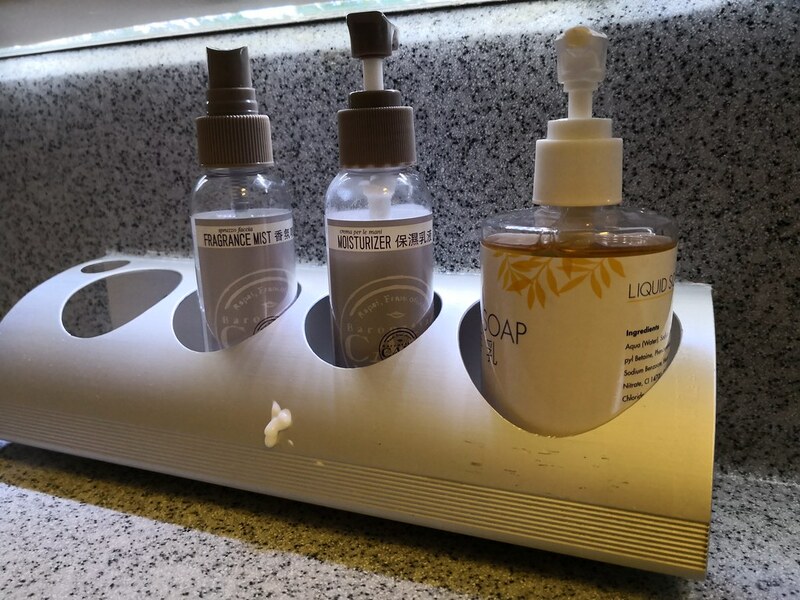 Halfway through the flight, I ventured to the washroom to find a pleasant lavatory that was furnished with hand wash, moisturizer and a fragrance mist. The conditions were clean and that was all that mattered. 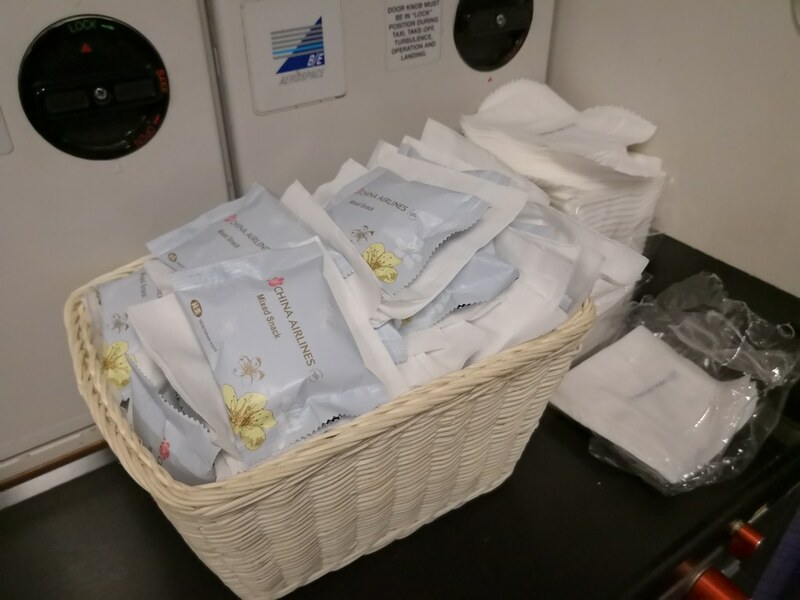 On the galley, snacks, juices and water was prepared but no service was done in the cabin since most passengers were happy to just sleep for the journey. 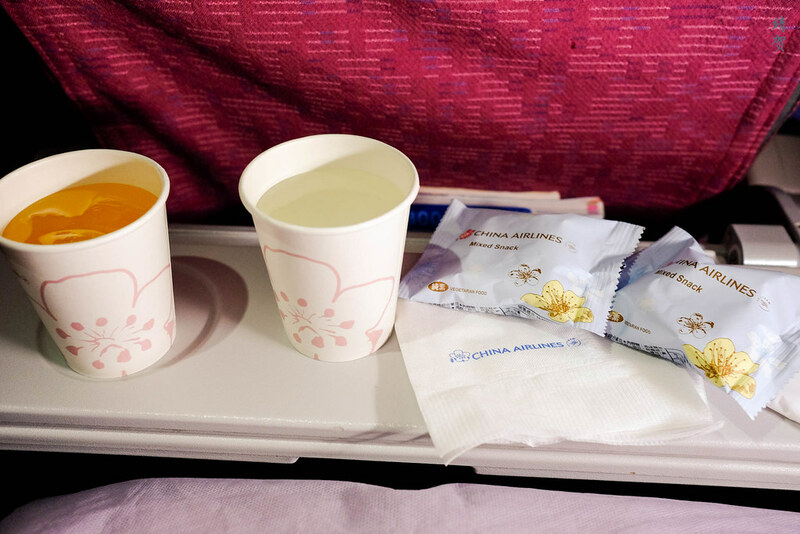 I grabbed a couple of the rice cracker snacks and poured myself a paper cup of juice before returning to my seat where I watched the movie ‘Battleship Island’. 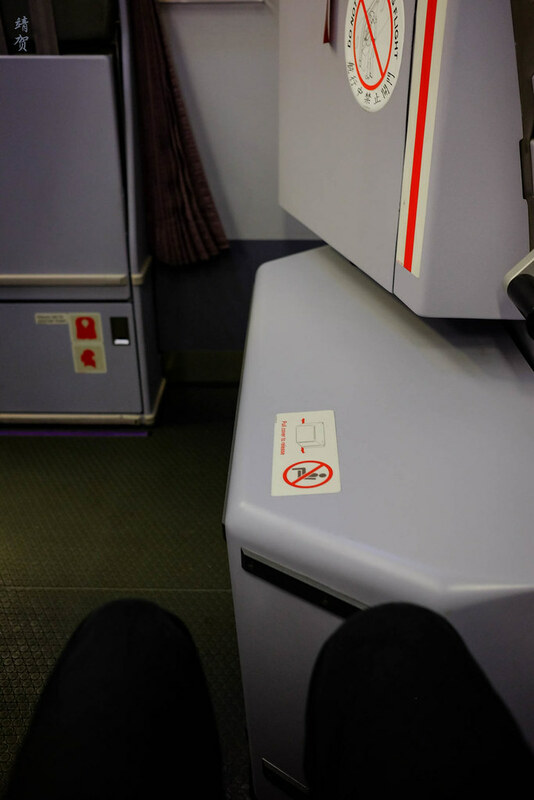 I liked how the tray table can be partially folded to hold smaller snacks and beverages thus ensuring one gets enough space while enjoying light snacks. in the seat. For the rest of the flight, I spent the time watching the movie and a couple of TV shows. 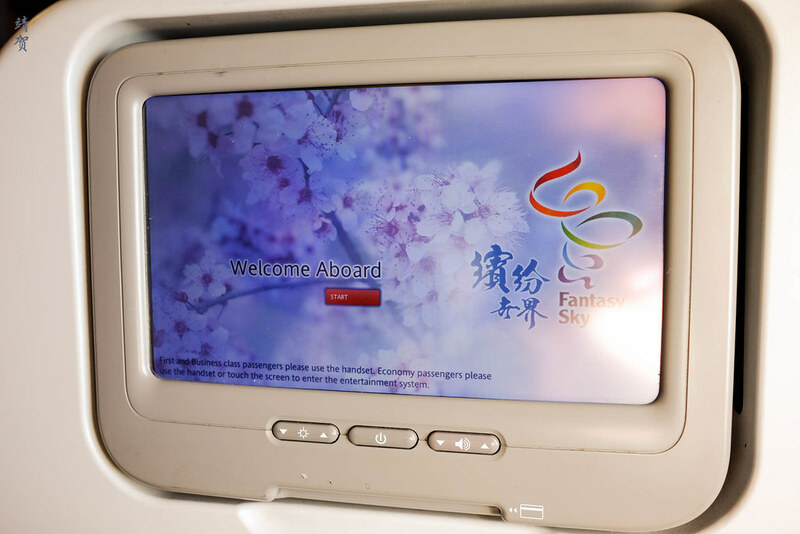 China Airlines has a decent entertainment system with relatively good content for the Asian traveller. While not the most cutting edge or diverse, it was alright for this regional flight as I did have something to watch or listen to for the duration of the flight. An early morning flight with no delays and a fairly smooth journey later, we started our descent into Hong Kong where the weather was partly cloudy. The fine weather did ensure we landed on time and it was not long before the plane came to a standstill. 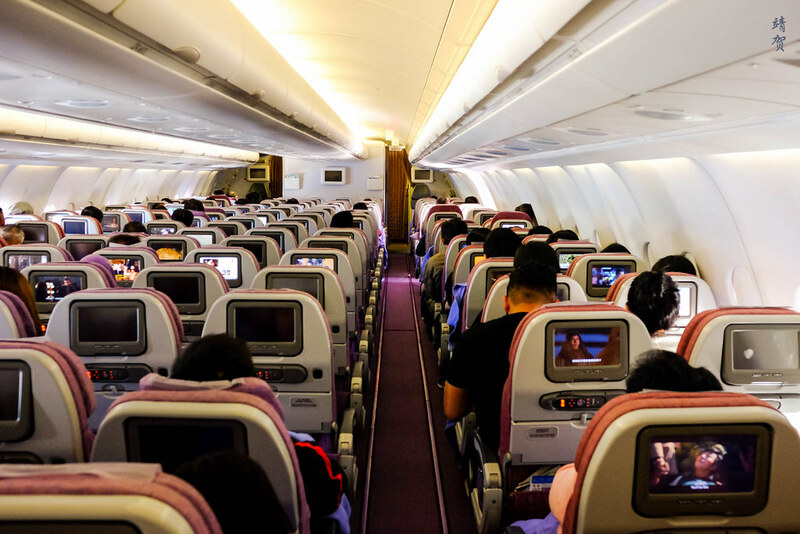 Disembarking the flight, we were directed to pass through the Business Class cabin and China Airlines fits the same angled lie-flat seats similar to the one onboard Singapore Airlines and Fiji Airways A330s. 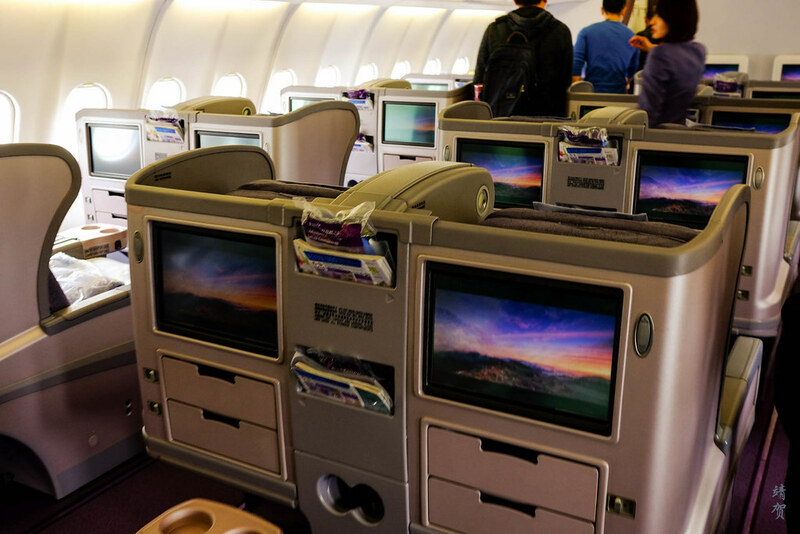 The colour scheme was a drab grey though so it did nothing much to improve the cabin ambience for Business Class. 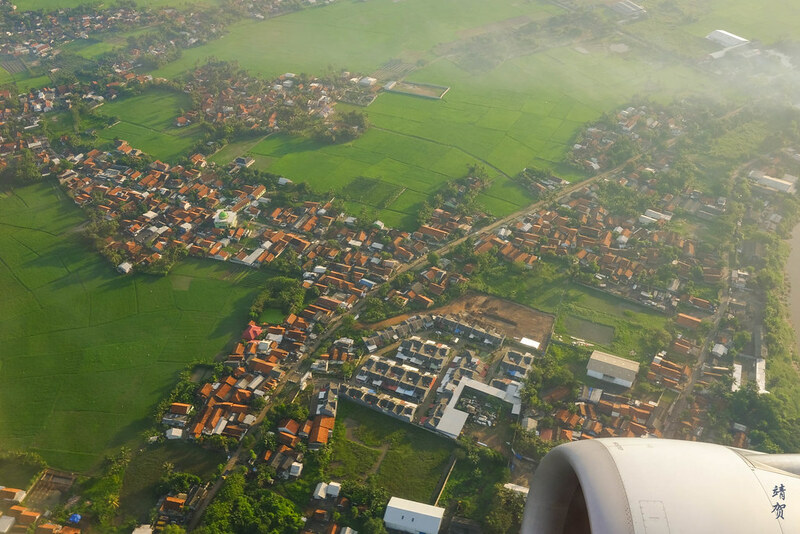 This regional price won me over with the combination of low prices and yet inclusion of meals, snacks, drinks, checked-in luggage and the ability to choose extra legroom seats at no additional cost. A light load made the cabin ambience quieter than usual and allowed me to spread out for more space. As a result, I would be tempted to fly with them again on this route provided the price remains. This flight does add a certain incentive for me to try to retain my Sky Team Elite Plus status.